This is the official webpage for bluemute. It was written by Steve and is great. It is a Windows service that will continually scan for bluetooth devices, and if your chosen device (normally your phone) is out of range, it will mute your computer so that it doesn't annoy your housemates. Then, when you get back into range, it will un-mute, so that you can enjoy listening to the melodic chants of Era at the intended volume. 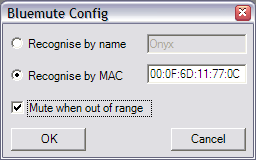 It is configurable to recognise your bluetooth device (phone) by either name, or more securely, it's MAC address. It will require the .NET framework to run.